Good morning! 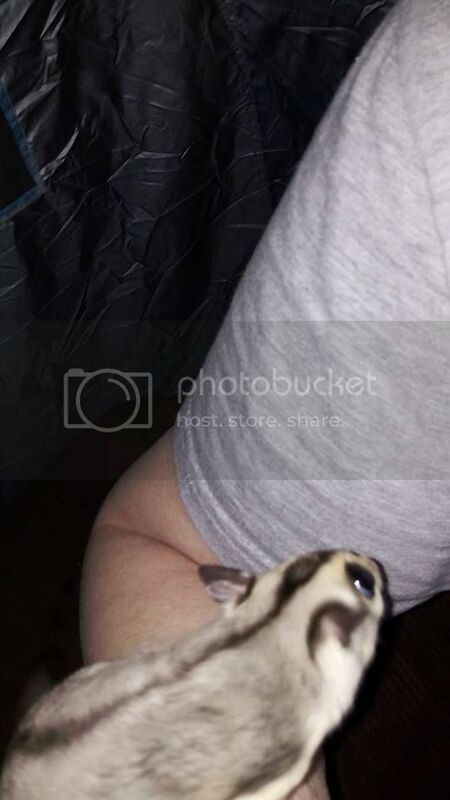 I originally posted in the "I am new" category, excited to pick up my two new gliders, Mercy and Luke, but my hubby decided to change the name of our new male to Caleb, as my 9 yr old son asked to name him. Mercy and Caleb joined our original 2 girls, Lucy and Grace on Saturday. We could not be more happy with how the introductions went. I figured Lucy would be more than likely to have a hard time, but it was Grace that did not particularly care to become friends. But by the end of the day, all 4 were in the same pouch in the new large cage I had purchased for all four. I am spending some extra quality time with Grace at the moment, as she is tolerant at this point, but seems like she doesn't want to share me with the other two. Caleb is the only male, and recently neutered so we don't have babies. We are just in it for the companionship. Mercy is warming up to me nicely. She is already starting to groom me when I have hand in pouch with her. Caleb, on the other hand, is a biter at the moment. Not enough to draw blood like Lucy was at first, but it is hard, and he not only bites like a hard pinch, but he tugs when he does, and it is just not my hand or fingers, it is anywhere on my body close to him. I am curious as to why. It hurts, and I don't necessarily pull away, but I can only take it for so long before I move away from his mouth, but not too far so as to allow him to think his bite makes my hand go away. I know in time once we begin bonding that it should decrease in frequency. My thought is that even if he is neutered, he has still claimed my females and perhaps he sees me as a threat? I don't know. Any thoughts? Hi and welcome! So glad to hear your males are neutered-mine are as well and I have two females. When they nip-I hiss and they stop. I have one nipper out of my four. If you are consistent and dont allow it, the little one will more than likely stop. It sounds like to me he is proving to be dominant and probably not due to the gender but the personality! I do have a question for you as well. What cage are you using for your four? I am looking for an even larger cage and not sure what to buy. My thought is that even if he is neutered, he has still claimed my females and perhaps he sees me as a threat? I don't know. Any thoughts? First, congrats on the intros!!! Biting or nipping can be from testing his boundaries to a fruity or dood smell on your hands. You can use glider talk like "Sssst" or "Tssh". It's glider talk for I don't like what you're doing . They usually grow out of this behavior. You also follow the noise with a firm no too. Thank you Dawn, for your input. So far, that does not seem to be working too well, but hey...what can I expect after just a weekend, right? I will be consistent as time goes by. Thank you for your input. I will do that. Mcage 2 Color, Extra Large Tall 3 Levels Ferret Chinchilla Sugar Glider Squirrel Animal Cage with 1/2 Inch Cross Shelves and Ladders, 30" Length x 18" Depth x 72" Height (with stand). The only thing I did not care for is that a couple of areas the cross bar sections were warped from the wire being a little stretched from the welding process, but was easily "blocked" with a couple of the ramp ladders ty-wrapped in case of possible wiggle worming through. Also, the feeding troughs are cheap. I used a couple of them for the occasional freeze-dried mealies and monkey biscuits. I have ceramic and glass bowls for the fresh diet. I just need to figure out how to make shift elevate them so no accidental pee/ poop gets in them. Or, come up with different or hanging bowls. I could have placed them on the 1/4 cross shelves, but am afraid the bowls might get pushed off and hurt the furbabies, ya know?